Charlotte Tilbury Hollywood Beauty Light Wand review, photos! Charlotte Tilbury is the queen of the glow. She really is. Her Filmstar Bronze and Glow is my fancy "going out" highlighter and now she's only gone and done it again. The Hollywood Beauty Light Wand launched recently and I took a notion to treat myself a few weeks ago. I got a preview of this a few months ago and knew I'd be buying it and you'll see why later. At first, I was a bit concerned by the spongey applicator and wondered would I waste a lot of product with it. But see the brown plastic section between the sponge and the rest of the tube? It has a locking mechanism so there's no wastage that way. But when we're talking about a squeezy tube, always take a gentle approach or you'll squeeze too much out! Now back to the sponge. It's got more of a soft fleece texture and you know how I love me some fleece. This makes application so smooth and seamless and while Charlotte says we can use the tip to both apply and blend the makeup, I know if I did that, I'd end up with a whole cheek full of highlight rather than just a subtle somethin' somethin'. A little goes a long way with this! The formula is everything I love in a liquid highlight. 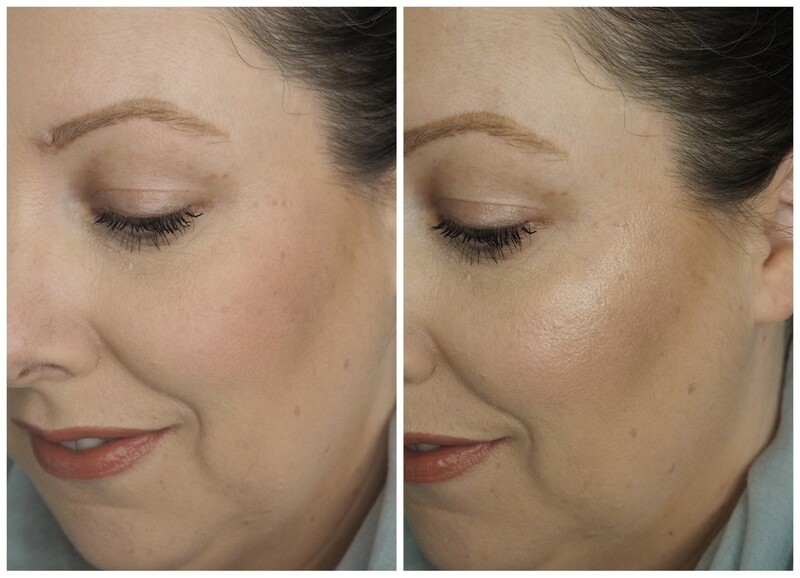 How many times have you tried a highlighter that blends away to nothing? Well that's not going to happen here. I dab on a few dots along the top of my cheekbone and have found that the best way to blend it out is with my finger. That way if there's any left over, I can apply a bit extra where needed, usually on the brow bone or on my cupid's bow. In terms of colour, it's described as being rose gold in tone, but it leans more champagne on my skin, making it more wearable for me. Blended out, I'm left with the softest sheen on the skin. We're talking lit from within lads. It manages to both catch the light and reflect it all in one go and instantly gives a lift to my complexion. In the winter, I tend to go for a more matte base, so I need a highlight that's going to balance things out without going wild. This is one of those highlighters that looks beautiful in both daylight and at night and photographs flawlessly. This is one of those foolproof highlighters that sets dry, looks wet and is easily buildable if you like the whole more is more thing. Now there's only 12ml in the tube and it's €35, but the amount I use each application is minimal so I ain't mad at it. But when I'm squeezing it, it feels like the tube is only half full. So we'll see how long it lasts. The Charlotte Tilbury Hollywood Beauty Light Wand is available now and if you're in the market for a really beautiful and easy to wear highlighter, definitely check this out. It's in Arnotts and Brown Thomas now and is also available from the Charlotte Tilbury website.